Francis Edward Glennan (1885-1914) was born at Biloxi, Mississippi. He married Miss Jennie Fries of Warsaw, Indiana on April 8, 1912 at Nativity B.V.M. In 1913, Francis became afflicted with glandular throat issues. He received medical treatment and surgery at the Touro Infirmary in the Crescent City. Unfortunately, doctors were unable to alter or remediate his condition and he passed at Biloxi on October 10, 1914. 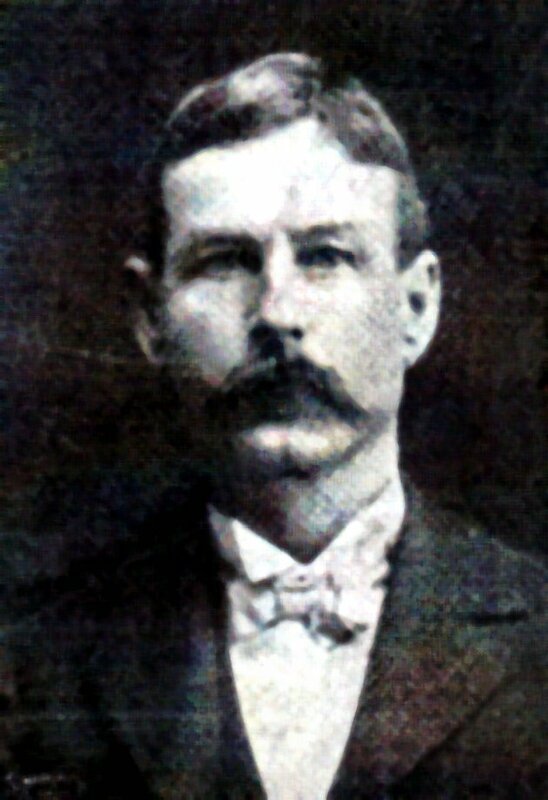 Francis E. Glennan had been associated with his father’s firm. Loyal Order of Moose, Biloxi Elks Lodge No. 606, Volunteer Steam Fire Company No. 1. Corporal remains passed through Nativity B.V.M. with burial Biloxi Cemetery. Sold automobiles in 1941. Lived on Hopkins Boulevard in 1972. Died on January 26, 1982. Maxine was a nurse in 1941. Althea S. Anderson (1898-1994) was born at Biloxi on July 18, 1898. She married George Rothwell Anderson (1890-1985) on October 26, 1926. One child, Glennan Edward Anderson (1931-2009), who was born December 29, 1931. Althea G. Anderson expired on April 5, 1994. George died in December 1985. Isidore Heidenheim, Sumner W. Rose, Jacob Tremmel, Joseph Venus, Edward Barq (1871-1943), J.C. Batton, John Swanzy, Meaut, tax collector; street commissioner; Castanera, water works superintendent; Dr. T.O. Hunter, medical officer, Louis Staehling, police chief; and Louis Goldman, city attorney. The Daily Herald, "The new administration of the City of Biloxi", January 4, 1911. The Daily Herald, “Rose Ordinance to repeal street tax killed”, April 5, 1911. The Daily Herald, “Glennan calls down Alderman S.W. Rose”, September 6, 1911. Theodore G. Bilbo (1877-1947) was sworn in as Governor of Mississippi on January 18, 1916. Mayor Glennan was president of the Bilbo Club in Biloxi and Ed Barq, vice-president. Governor Bilbo had strong support on the Coast from Charles L. Rushing (1881-1923) of Biloxi. Other elected officials to serve the City of Biloxi from 1916-1917 were: Marshall L. Michel (1886-1930+), city clerk; Henry J. Meaut (1842-1934), tax collector; Richard M. Randolph (1867-1930+), police chief; F.W. Elmer Jr. (1881-1948), city judge; John F. Eistetter (1881-1953), Alderman-at-Large; Edwin R. Ott (1894-1950) and Edward Barq (1871-1943)-1st Ward Aldermen; Walter H. Hunt (1887-1961) and 2nd Ward Aldermen; Jacob Tremmel (1876-1941) and Albert L. Bakeler (1889-1973)-3rd Ward Aldermen; Charles B. Foster (1877-1931) and W.L. Via (1858-1920+), Fourth Ward Aldermen; city attorney; John A. Swanzy, street commissioner and E.L. Castenera, water works superintendent. When it was announced that T. Woodrow Wilson was elected president of the United States on November 1916, the Biloxi City Council was in session. The news was received fromThe Daily Herald by a telephone call. Julia Cook Guice, Lagniappe, (City of Biloxi, Mississippi-undated). Mississippi State Supreme Court, “State ex rel. Edward Glennan v. Democratic Executive Committee-Circuit Court, Harrison, Mississippi”, February 1919. Harrison County, Mississippi Cause No. 1188, “Last Will of Ann Glennan”-December 1898. Harrison County, Mississippi Circuit Court, “Edward Glennan v. Democratic Executive Committee”, December 1918. The Biloxi Herald, “Hazel Lucille Glennan, July 25, 1891, p. 4. The Biloxi Herald, “Mother of Ed Glennan”, November 26, 1898, p. 4. The Biloxi Herald, “Mable Ruth Gillen”, December 7, 1895, p. 8. The Biloxi Herald, “Against the brothel. Choose which you will serve”, December 5, 1896, p. 1. The Biloxi Daily Herald, “Mrs. Ann Glennan”, February 19, 1899, p. 8. The Biloxi Daily Herald, “William A. Glennan”, January 5, 1900, p. 8. The Biloxi Herald, “Park Ordinances”, April 21, 1905. The Biloxi Herald, “Declaration of intent to enter public lands”, May 6, 1905. The Biloxi Herald, “Ordinance No.”, May 6, 1905. The Daily Herald, “To vote on commission form of government”, June 4, 1909. The Daily Herald, “Addition to store of Edward Glennan”, December 15, 1909. The Daily Herald, “Fries-Glennan nuptials today”, April 8, 1912. The Daily Herald, “Miss M. Gillen died last night”, October 3, 1912, p. 8. The Daily Herald, “Glennan Park receiving much improvement”, June 6, 1913. The Daily Herald, “Mayor Glennan declares enactment of an oyster ordinance”, January 21, 1914. The Daily Herald, “Glennan announces for election”, May 26, 1914, p. 2. The Daily Herald, “Luscious peaches in Glennan yard”, July 29, 1914. The Daily Herald, “Francis E. Glennan, eldest son of Mayor Glennan, claimed by death”, October 10, 1914. The Daily Herald, “Glennan funeral is well attended”, October 14, 1914. The Daily Herald, “Walter Hunt seeks to be Alderman”, November 5, 1914. The Daily Herald, “Interest in municipal election centers around 2nd Ward contest”, December 8, 1914. The Daily Herald, “Walter Hunt is elected in 2nd Ward of Biloxi”, December 9, 1914. The Daily Herald, “New Board of Mayor and Aldermen appoint city officers last night”, January 6, 1915. The Daily Herald, “Mayor investigates anonymous letters to officials”, May 18, 1915, p. 1. The Daily Herald, "Batton resigns as member of council-effective Jan. 1” December 8, 1915. The Daily Herald, “Gorenflo named as Alderman”, December 21, 1915. The Daily Herald, “Albert Bakeler is a candidate”, April 21, 1916. The Daily Herald, “Mayor Glennan is seeking election”, April 28, 1916, p. 1. The Daily Herald, “Alderman Hunt’s ‘hat in the ring’”, April 28, 1916. The Daily Herald, “Alderman Lewis announcement”, April 28, 1916. The Daily Herald, “Glennan certain of victory, say Biloxi citizens”, June 27, 1916. The Daily Herald, “Glennan goes in as Biloxi Mayor, defeats Pringle”, June 28, 1916. The Daily Herald, “Campaign is too close to figure today’s winners”, July 3, 1916. The Daily Herald, “Biloxi’s books to be audited last of October”, July 12, 1916. The Daily Herald, “Wilson’s election ends Council meet”, November 10, 1916. The Daily Herald, “New Board begins official duties”, January 3, 1917. The Daily Herald, “Council members now in Atlanta”, January 24, 1917. The Daily Herald, “Council handles routine matters”, April 13, 1917. The Daily Herald, “Roy Glennan at Riviera”, May 17, 1917. The Daily Herald, “Glennan’s store robbed last night”, May 22, 1917. The Daily Herald, “Failed to pass examination”, May 31, 1917. The Daily Herald, “Biloxian joins aviation corps”, August 18, 1917. The Daily Herald, “Coast infantry still progressing”, August 21, 1917. The Daily Herald, “Mayor Glennan visits Gulfport”, September 4, 1917, p. 3. The Daily Herald, “Delegates [American Prison Congress] named by Mayor Glennan”, November 14, 1917. The Daily Herald, “Dance honors soldiers”, December 12, 1917. The Daily Herald, “Glennan favors Biloxi carnival”, December 29, 1917. The Daily Herald, “Too much friction cause of cops downfall asserts Mayor Glennan”, January 3, 1918. The Daily Herald, “Roy Glennan working hard”, February 28, 1918. The Daily Herald, “Roy Glennan transferred”, May 27, 1918. The Daily Herald, “Mayor Glennan issues light less night proclamation to save fuel”, August 1, 1918. The Daily Herald, “Some Biloxi ordinances once believed necessary may yet be thought wise”, September 16, 1918. The Daily Herald, “Roy Glennan here”, September 23, 1918. The Daily Herald, “Roy Glennan leaves”, October 2, 1918. The Daily Herald, “Roy Glennan recovering”, October 19, 1918. The Daily Herald, “Interest shown in primary election”, November 13, 1918. The Daily Herald, “Exciting race held for Mayor in Democratic primary yesterday”, November 20, 1918. The Daily Herald, “Kennedy elected Mayor of Biloxi by small majority of two ballots”, November 21, 1918. The Daily Herald, “Glennan contests Biloxi Mayoralty”, December 4, 1918. The Daily Herald, “Roy Glennan home”, January 6, 1919. The Daily Herald,“Supreme Court to hear of Biloxi Mayoralty Contest”, January 21, 1919, p.
The Daily Herald,“Program Tuesday for reception”, January 27, 1919. The Daily Herald, “Biloxi Mayoralty case called today in Supreme Court”, February 17, 1919, p. 3. The Daily Herald, “High Court says Kennedy mayor”, March 4, 1919, p. 2. The Daily Herald, “James Glennan, June 3, 1931, p. 3. The Daily Herald, “Ellen Glennan”, September 25, 1931, p. 2. The Daily Herald, "Mrs. Glennan dies in Biloxi Hospital", February 4, 1933, p. 1. The Daily Herald, “Miss Ethel Glennan”, October 25, 1966. The Daily Herald, “Mrs. (sic) Viola (sic) Glennnan”, January 22, 1969. The Daily Herald, “Miss Maud Colbet”, August 21, 1969. The Daily Herald, “Miss Maurice [sic]Tucei”, August 21, 1969. The Sun Herald, “Althea Glennan Anderson”, April 6, 2004, p. A . The Sun Herald, “Glennan E. Anderson”, April 11, 2009, p. A .